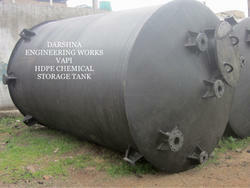 We are a unique entity in the industry, actively committed to providing a qualitative range of HDPE Chemical Tank. Incorporated in the year 2010, at Vapi, (Gujarat, India), we “Darshna Engineering Work”, are a Sole Proprietorship Firm, engaged in manufacturing, wholesaling and retailing optimum quality Reaction Vessel, Chemical Tank, Storage Tanks and FRP Scrubber. Under the direction of our Mentor “Kiran Bhai J Mistry (Proprietor)”, we have been able to meet the specific needs of clients in the most efficient manner. We are also provide Maintenance Service, Repairing Service, Fabrication Service, Pipe Line Jointing Service.